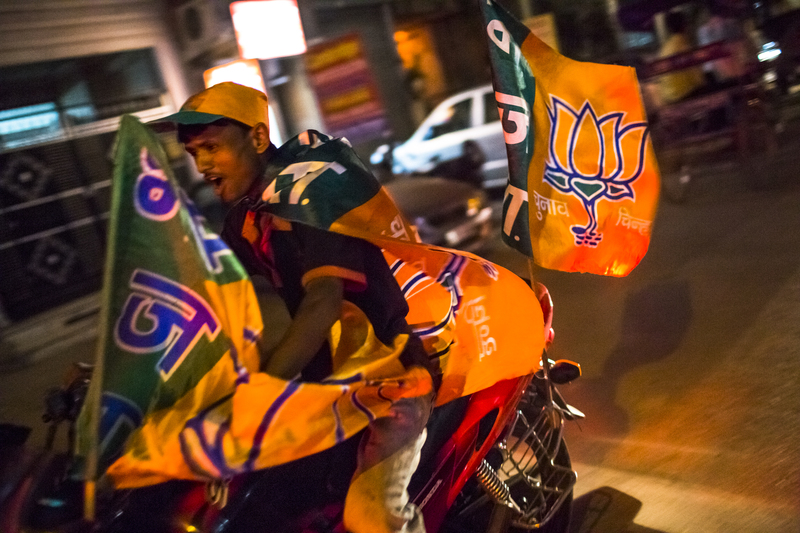 India's right-wing Bharaitya Janata Party (BJP) made serious gains in regional elections on Sunday, dealing a blow to the left-of-center Indian National Congress. Ahead of the prime ministerial elections, Congress suffered additional blows from the Aam Admi Party, a new anti-corruption party that made headway in some of Congress's traditional strongholds. Congress leader Sonia Gandhi, and her son and successor, Rahul, said they accept the electoral results with "humility." In New Delhi, a traditional Congress stronghold, the BJP came in first while Aam Admi came in second with 28 state assembly seats. In contrast, Congress only got eight seats in that region. The anti-corruption party, known as the "Common Man," said that the electoral results show the BJP and Congress, India's two most prominent parties, that they must embrace broader demographics. "This election showed the way for honest politics. This is an indication that if the Congress and BJP don’t change, they will be removed," said Arvind Kejriwal, who defeated one of Congress's most popular leaders in the New Delhi elections. All of this is especially important ahead of the impending prime ministerial elections. The BJP's presumed candidate, Narendra Modi, has been courting supporters nationwide despite a questionable past. He is commonly believed to have played a role in the anti-Muslim pogroms in his home state of Gujarat in 2002, where Hindu nationalist protestors rioted and destroyed Muslim-owned homes and businesses. Modi has often been credited with improving Gujarat's economic situation, but the gains have been more pronounced in the Hindu parts of the state; Muslims are still on the receiving end of communal tensions and often have trouble securing jobs and housing. During the 2002 pogroms, protestors were often able to successfully evade law enforcement, which led many to suspect government involvement in the event. But Modi's economic message has wide-spread appeal throughout India, and his success is amplified by confusion over the leadership of the Congress. Though Rahul Gandhi is being set up to take over the party, some suspect his mother, Sonia (no relation to Mahatma Gandhi), may come back because of the devastating electoral losses — something Congress spokespeople eagerly refute. They also believe that, despite the early results, the BJP does not have enough momentum to carry a national election. "There is no uniform momentum or direction for BJP or Modi. There is no wave," said spokesman Abhishek Manu Singhvi.